People were skipping lunch. Not one potato chip! Knew something better was coming. The oven was on! Ms. D. insisted "home-cooked" was the trick. They gathered in the galley. They cooked and they boiled! The good smells sustained them as they labored and toiled. So they set the table and prepared for the fun. (I'd mention their names, but I think you know who). 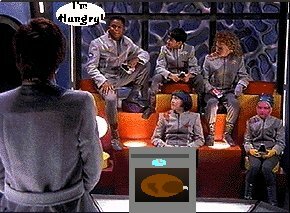 The Commander carved the turkey. His skill was great! He passed out the slices, and each Case loaded their plate. "Mashed potatoes? Stuffing? Cranberry sauce?" Then they chowed down. Wow, what a feast! This ought to happen every month, at least. Banter filled the air. Everyone was cheerful. Tales of old times, oh, what an earful! At last, with a sigh, everyone got up. All cleared their plate, their fork, their cup. Tiredness had hit them without any warning. Thinking of the memories they wanted to keep. One thought persisted: "I can't wait till next year!" Copyright � 1999 KayLynn. All rights reserved. Used by permission.